Visits of audio company owners, including those biggest ones, are quite common nowadays in Poland. It turns out, that we are an attractive market, with an audio scene with traditions and an interesting shade. However a visit of three important people, who do not go anywhere often, the people from Accuphase in Krakow, my city, is something special. 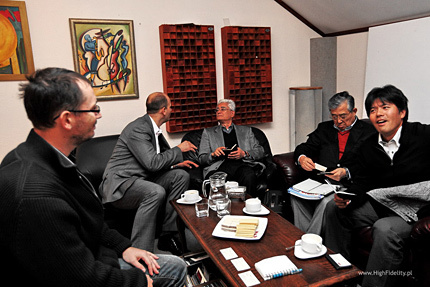 The meeting took place on October 13th, 2011 in Krakow, in the company salon of the Polish distributor of this brand, the company Eter Audio. Three guests from Japan were there: Mr. Jim S. Saito (Shigemasa Saito) – director and co-founder, Mr. Yasumasa Ishizuka – Advisor to the Management, one of the founders, and a representative of overseas sales, much younger than both the founders – Mr. Tatsuki Tozuka. I talked with all the guests, but most questions; quite understandably, I posed to Mr. Saito and Ishizuka. The first of the gentlemen – is known: he founded the company and knows everything about it. Mr Ishizuka turned out to be an equally interesting interlocutor – we was the co-founder of the company, when together with a group of engineers from the company Trio-Kenwood, led by Mr. Nakaichi Kasuga and Jiro Kasuga, which were later joined by people from Marantz (Japan) and Luxman, responsible there for expensive audio systems, who were disappointed with the company politics and decided to fulfill their wildest dreams and ideas. Mr. Saito, currently the head of the company, and previously their vice-director, one of the engineers from Trio-Kenwood, decided to put everything on one card – and he was not disappointed. So the company Kensonic Laboratories, Inc. was founded, which was later renamed to Accuphase Laboratory, Inc. Now it is one of the most recognized high-end brands in the world, and inspirations with the design of the American McIntosh are long time gone – now this is a common wealth, shared with - for example - Luxman. Almost from the very beginning the design, production and sales – all company operations – are run from the company headquarters based in Yokohama. Wojciech Pacuła: When exactly was Accuphase founded? WP: Who exactly did it? 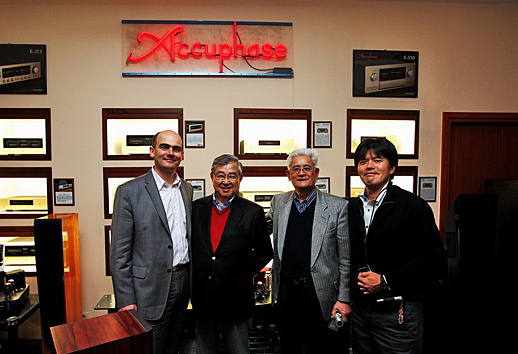 Yasumasa Ishizuka: Accuphase was founded by the Kasuga Brothers (Nakaichi and Jiro Kasuga), who were the founder of KENWOOD Electronics of Japan with some other staff members, who joined from KENWOOD. Those included Shigemasa Saito and Yasumasa Ishizuka. WP: What is the background of the first people in Accuphase? JS, YI: The Kasuga brothers were the founder of KENWOOD Electronics. The staff members, who initially joined the Kasuga brothers at the start of Accuphase, were all from KENWOOD, enjoying important positions of responsible manager class at KENWOOD Electronics. However, the company KENWOOD was struggling for its profitability and survival, as it expanded too quickly to follow the hyper economic expansion of Japan at that time. Whereby there were some conflicts over the operational ways and means of the company among the management. The Kasuga brothers, who were tired of keeping up with the demands by stock holders for higher dividends and of the ever increasing expansion of the size of the company, decided to muster together those people who had the same common interest as theirs to establish a new high-end audio equipment manufacturer of outstanding excellence and quality. WP: Why did you make this? JS: Prevailing in the audio market some 40 years ago, were mostly those products of medium price categories, allowing the class of top quality equipment to be shared by the manufacturers of foreign countries. This gave us a motivation to challenge to the development of products of a step or two higher in quality gathering all of the engineering expertise and knowhow gathered by that time. The very first group of the products developed were a power amplifier Model P-300, a pre-amplifier C-200 and an AM-FM stereo tuner T-100. 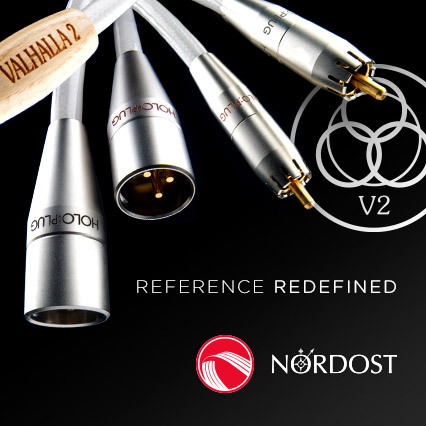 Those products received an instant acceptance of the then audio market, enjoying an excellent reputation for their sound quality and performance characteristics. WP: How did you come to digital products? First of all, speaker systems that works as a transducer of electric energy to sound one. Secondary, players and tape decks that convert the signal information recorded on disc and tape to electric signals. Thirdly, amplifiers that amplify the aforementioned electric signals, and produce energy to drive speaker systems. Each category of the product groups has its own feature and specialty. As we are a group of specialists in the part of electronic amplification, we started with the aim to manufacture products of the best and first class quality of the world. In the second half of 1970s, there became available the converting technology of analog audio signals into digital signals with the birth of the CD Disc and CD Players. When the digital technology was introduced, we first thought the analog disc might tread a dwindling path and might affect our own businesses too. As learning more about potentials of the digital technology, we came to know it would open new areas that our accumulated engineering expertise and knowhow serve well for the digital audio technology. Having started engineering works in 1980, we could unveil the first digital CD player combination of the DP-80 and DC-81. As expanding the range of digital equipment, we took the advantage of the technology to further the perfection of our analogue audio engineering technology, and brought out excellent products highly appreciated in the markets. WP: Who is responsible for it? JS: The senior managing director & chief engineer Mr. Masaomi Suzuki has been taking the responsibility of the development, assisted by a number of other specialist engineers. He was hire perfectly for the purpose to develop digital side of Accuphase.